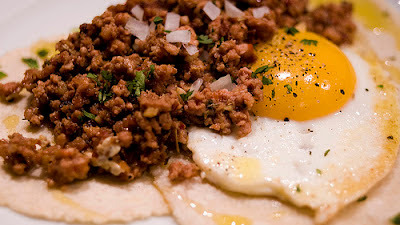 I was so pleasantly surprised when I made this chorizo....it was FULL of flavor. It was definitely different than your store bought chorizo - it was BETTER! I will never go back to the store bought stuff. This homemade version can be customized to the meat you have on hand. I made mine with 1/2 lean ground beef and 1/2 lean ground turkey but it can be also be made with pork or a mixture of meats. They key is the seasoning! Place all ingredients into a large bowl and knead meat until spices are completely combined. Meat is ready to use. Form into patties, stuff into casings or cook loosely and crumble...it's all delicious!